Your yard is a blank slate with nearly limitless potential. Your imagination can create a plan that embodies your unique personality, style and vision. But as you plan, it is important to remember the bigger picture: the environment. If ecological impact is not considered in the plan for your yard, landscaping can be a drain on the surrounding environment. However, if the right steps are taken, your property can contribute to your neighborhood's – and society's – ecological well being. 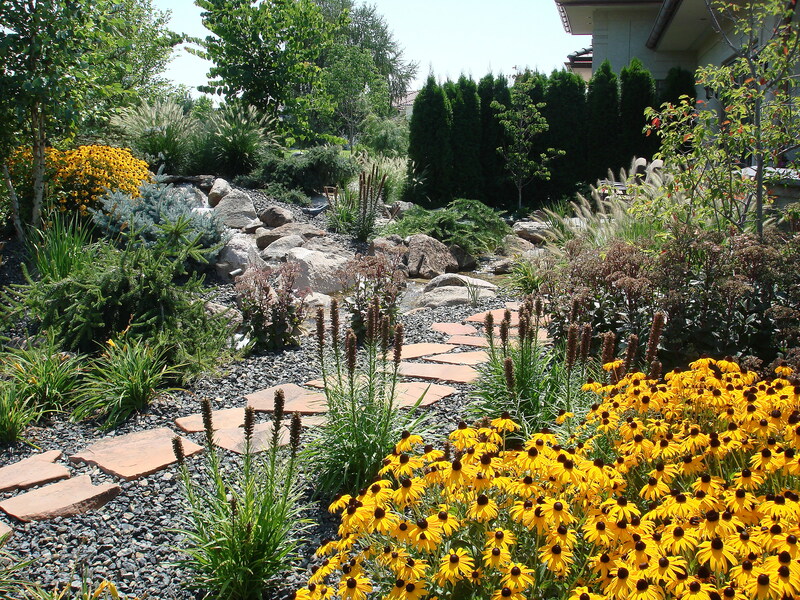 Photo courtesy of Summer Lawns Inc., Boise, ID. Another consideration in selecting plants is to determine if there are specific environmental jobs you would like the plant to do for you. For instance, if you are looking to provide protection from strong winds, consider evergreens planted on the windward side of your home. Conversely, trees shading homes can reduce attic temperatures by as much as 40%. Or, if you have a pond, you will need the plants in your pond to work for you, providing shelter and nesting help to aquatic life.